A tweet from @avantgame (Jane McGonigal - game designer, PhD. 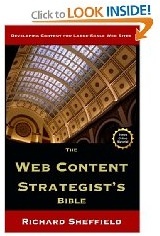 researcher, futurist) really struck a chord with me about Web content. With a few small tweaks it makes a good manifesto. "Looking at an email query, I realized tonight: I don't make games ABOUT things. I make games IN ORDER TO do things. To achieve goals." Content Manifesto: Don't create content ABOUT something. Create content IN ORDER TO DO something. To achieve goals. All content should be in service of a goal. If not, cut it. For some projects this might even be a good field to capture in the content matrix - Page Goal. What are you trying to accomplish with the content on this page? Write it down and get agreement. Agency Survey Regarding Content Strategy - Good News! A few weeks ago, Eat Media (a top content-focused Web agency) sent out a survey to Web agencies and design shops. They wanted to get a feel for what they know and how they feel about the whole "content strategy" thing. 29% have content strategists/content developers on staff. 35% use a mix of freelance/contract and in-house talent. 31% use a third-party vendor or contract strategists. So the work is out there! Check out the link for all the details. Don't miss next week's content strategy meetup—"Content Analysis: From Inventory to Insight" Wednesday, April 7 at Roundbox Global. Understanding your content needs is the critical first step in your content strategy. Sure, it begins with a content inventory in a big spreadsheet. But that's not where it should end. How do you dig deeper? How deep should you dig? What insights might you discover? Using plenty of practical examples, Colleen Jones will reveal the important elements of content strategy and content analysis. Colleen is the Principal of Content Science, a boutique content strategy consultancy. As an enthusiastic pioneer in user experience, Colleen has guided strategic initiatives for large brands such as InterContinental Hotels Group, Centers for Disease Control & Prevention (CDC), and Cingular Wireless (now AT&T). She also participated in the landmark Content Strategy Consortium at IA Summit 2009. Jones is Chair of CHI*Atlanta, organizer of Atlanta Content Strategy, and a notable author.